I don’t think I believe in fate. We’re all the keepers of our own destiny surely, and we make our own futures don’t we? However, I do believe that there are pathways and opportunities just sitting in front of us constantly. Each day is a brand new chance, every time you go somewhere new you are opening up different roads to a new place, a new adventure, the chance to meet new people and do exciting things. Now stick with me here, it does get a little destiny, fate, swirly whirly…chaotic and twirly and not in a good way! I had a dream and we all know that’s how every good story starts, but seriously I had a dream about Reiki, it wasn’t in any detail, and I can’t even remember the dream, I just know it was about Reiki. I woke up, did a quick Google search and weirdly there was a whole holistic thing going on in Colne! So I hot-footed it over there and found myself trapped in a toilet cubicle, having a full on panic attack. I don’t know why I decided to drive to Colne all by myself and think I could wander around a holistic festival as though I belonged there! I managed to calm myself down and did get to see more of the town hall than just the toilets. Unfortunately, I didn’t really find anything of much use there though and left wondering why my subconscious had led me there. I think it was to give me that horrific panic attack and give me the strength to overcome it. It might not seem like much to some people but something clicked in my brain at the moment, I don’t know exactly what it was, but something changed. It wasn’t as though I’ve never had a panic attack since I have but I always think back to that specific one. I was on my own, in an unfamiliar place, surrounded by crowds of people I didn’t know. There was only me to get myself out of the anxiety. And get myself out I did! I attended a Reiki course after some research and I did gain some personal peace and a sense of wanting to help others. I still have a way to go with the Reiki if I want to use it for others but it gave me some confidence after being anxious to attend the course and also with the whole holistic festival. It made me realise that if I look at things as though they are challenges and opportunities then they automatically become easier to face and ever so exciting! I have also decided against writing the second book and instead, I will be writing them as blog posts, I want to be as open and honest as possible about my anxiety, I warn you it’s not pretty but I want people to know they’re not alone with their crazy, anxiety heads! 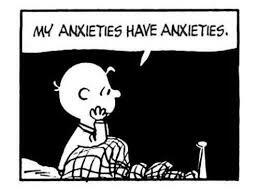 “Having anxiety and depression is like being scared and tired at the same time. It’s the fear of failure but no urge to be productive. It’s wanting friends but hating socialising. It’s wanting to be alone but not wanting to be lonely. It’s caring about everything then caring about nothing. It’s feeling everything at once then feeling paralysingly numb.” – Rudy Caseres. Next Don’t fight the fear, follow it.